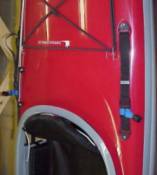 Rescue straps are designed to be used in conjunction with a paddle and/or a paddle float. To use the rescue straps, loosen the straps using the sliding, thumb-operated buckle. Slide the paddle through both sets of straps, making sure the blade on the end of the paddle away from the kayak (the end with the paddle float attached, if you are using one) is lying parallel to the surface of the water, and tighten the straps across the paddle shaft. Facing the stern of the kayak, climb onto the deck of your kayak from the paddle float side, slide your feet into the cockpit, carefully turn so you can slide into your seat. When seated comfortably, reach behind yourself on each side and pull the plastic quick release barrels to release and retrieve your paddle safely.